For the first time in a few years, I really wanted to watch a show when it was broadcast live. I had been content to watch shows 2 or 3 days past the air date so that my wife and I could watch them when we had the time. It made our lives easier and less hectic. But a finale is different and I wanted to be there when it ended. So Jen and I, and my sister and brother-in-law gathered at my parents house to watch the end of How I Met Your Mother. How I Met Your Mother has been a show steeped in mythology and building towards this meeting from the pilot episode (see this wonderful article from the AVCLUB that traces the perception of the show from Day 1). But mostly I loved to watch this show because I knew it had an end. Ted had to meet their mother. As far as titling goes, it is right up there with Snakes On A Plane, and without the meeting, the entire audience gets cheated out of what is rightfully theirs. Reflecting on that journey made me think about the storytelling that I see in class and how it reflects the TV and Media that is, and has been, around for awhile. 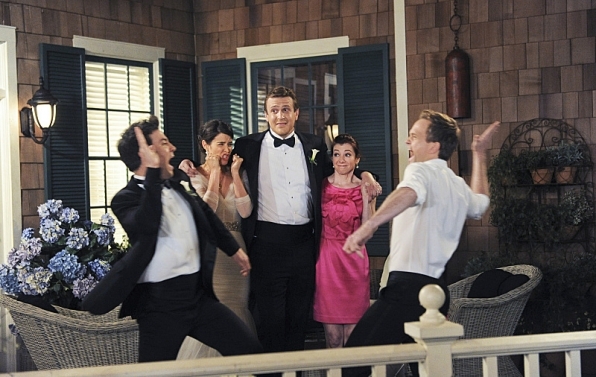 It made me realize that How I Met Your Mother is an anomaly, in that it shared a concrete goal. We knew where it was heading, and that gave the show a stronger narrative thread. I cared about the characters because I knew what was going to happen, and I was more willing to put up with some weaker threads knowing of the payoff that was to come. Most shows don’t give away their endgame, and are produced to go on as long as their audience is willing. I find this makes it easier to give up on a show because I am not tied into the ending. This latter style is what I see from my students, and that I can recognize in myself. Stories are often started, but are ended abruptly or with little satisfaction. We tell stories like we need to draw out action, and have as little resolution as possible. That is all a 22 minute episode will allow. So how do we make this better? We need to start at the end. The creators of How I Met Your Mother had the end in mind from the first season, which is evidenced by footage used in the final episode that was filmed during the first season (I kept that deliberately vague so as not to spoil anything). Working backwards allows the storyteller to keep focus on the end while moving through the story. This makes sense to me. We do this when we backwards plan a unit, and we do this when are goal setting, so why not when we are trying to build a story. The next time I introduce a story unit, I am going to get my students to work from the end, and see if we can’t get a great beginning.